PARIS, France (CelebrityAccess MediaWire) — With the loud roar of the engines nearly drowned out by the excited crowd, the Monster Jam Truck Show brings a popular form of entertainment from middle America to Paris. The show, first exported by Live Nation to France 2005, succeeds in bringing a show that was initially considered “too American” to Europeans, according to the Wall Street Journal. Live Nation is showcasing more event alternatives to major rock concerts such as Madonna or U2, after reporting a $139 million loss last year on a revenue of $2.9 Billion due to high fees paid to performers. 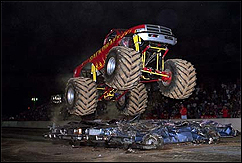 The Monster Truck Jam shows are cheaper to produce than the concerts, and Europeans seem more open to American-style entertainment now that tensions over the 2001 U.S. led invasion of Iraq have abated.